Moose Jaw Toyota is located at 1743 Main Street North in Moose Jaw, SK and is happily serving Moose Jaw and the surrounding area. Moose Jaw Toyota is your go to dealership for new and pre-owned Toyota Vehicles. Our detailed Product Advisors will find a vehicle to suit your needs and our top-trained Technicians are here to make your experience easy. Visit us at Moose Jaw Toyota today to see how Satisfaction is Taylor Made. Whether you sustained a small dent or serious damage, our trained technicians will restore your vehicle to showroom condition. 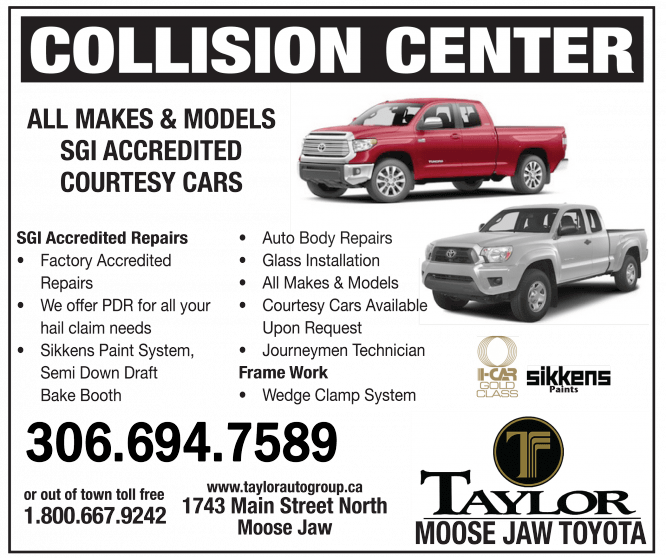 Call or stop by our Collision Center just behind Moose Jaw Toyota to book your appointment, today! For more information on our services offered at our Autobody Shop click HERE.